Belisario is, quite simply, one of Donizetti’s finest achievements. 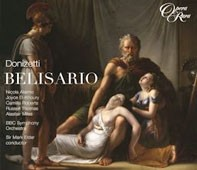 Dating from the high watermark of Donizetti’s maturity, with its premiere in 1836 (the year after the debut of Maria Stuarda in Milan and Lucia di Lammermoor in Naples), Belisario proved a triumph on stages throughout the 19th century. Awarded ‘Album of the Week’ by Hugh Canning – Sunday Times Culture, October 2013. SCENE I A large courtyard in the royal palace of Byzantium, with a throne to one side. A colonnade at the rear of the stage commands a view of the city beyond. Senators and populace are gathering to celebrate the triumph of the general Belisario, returning victorious from his campaigns in the Italian peninsular. His daughter Irene is among the foremost who are assembling to greet him, and she hastens to join the growing crowd outside. Her mother Antonina, on the other hand, shows no such eagerness. Entering with Eutropio, the head of the imperial guards and a man ambitious to become her paramour, she reveals her conviction that Belisario was responsible, many years earlier, for the death of their infant son, Alessi. In Belisario’s recent absence, one of his slaves, Proclo, has made a dying confession that his master had, when Alessi was an infant, ordered him to murder him. He had consequently carried the child forth from the city, but, unable to strike the blow, had abandoned him upon the seashore, there to perish or survive as fate should decree. Convinced that Alessi has long since perished, and now with this damning evidence to lay at Belisario’s door, Antonina has been plotting with Eutropio to encompass her husband’s destruction. Together they have had prepared forged documents which will incriminate him, showing him guilty of treason against the Emperor, Giustiniano. At Eutropio’s urging that she keep up appearances, Antonina, too, goes to join the crowds outside. Accompanied by his imperial guards, the Emperor Giustiniano enters and mounts the throne. The Triumph of Belisario takes place, with the general himself appearing crowned with laurels and wearing a purple mantle over his golden armour. He descends from his chariot and presents his trophies to Giustiniano, but pleads for the lives of his captives. Giustiniano acquiesces, placing their fate in his hands. As all disperse, Belisario sets his prisoners free. One, however, declines to depart: Alamiro, a young warrior who states that, if he were to be separated from Belisario, life would hold no meaning for him. Each, in fact, feels strongly attracted to the other, and since Alamiro declares that he is of Greek origin, Belisario invites him to enter his household, there to take the place of his long-lost son. Belisario is now joined by Irene and Antonina, but their reunion is very soon interrupted by Eutropio who comes demanding in the name of the Emperor that Belisario relinquish his sword. There is general consternation, but Belisario obeys, surrendering his weapon not to Eutropio but to a man he says he can respect as a warrior – Alamiro. Disarmed, he is led away by Eutropio and the guards. SCENE II. The Hall of the Senate. The Senators gather, wondering why they have been so hastily summoned. Giustiniano informs them that Belisario has been accused of a horrendous crime. Eutropio proceeds to narrate how, upon this very evening, it had been intended that the victorious troops should rise in rebellion, assassinating Giustiniano and proclaiming Belisario emperor in his place. Belisario vigorously denies the existence of any such plot, but is at a loss for an explanation when Eutropio produces the letters he had written home to Antonina, but now with treasonable sentences added in a handwriting imitated from – and identical with – his own. Far from supporting her husband, Antonina declares that the letters are exactly as she had received them, and then, when taxed by Belisario with betraying all her natural duties and sentiments as a wife, produces her trump card: the accusation that Belisario had organised the murder of Alessi. In his own defence, Belisario can only state that he had had a horrific dream in which he saw that Alessi, if he lived, would one day be responsible for shaking the Greek Empire to its foundations. He had therefore acted – against all his fatherly impulses – to protect his country. This defence is of no avail in the face of Antonina’s vehemence, and Belisario, condemned by all except Irene and Alamiro, is led away to prison. SCENE I A remote part of Byzantium, at the entrance to the prisons. Alamiro has received news that Belisario’s death sentence has been commuted to one of perpetual exile, but, as the grieving army veterans hasten to inform him, he has not yet heard of how Eutropio, twisting to his own advantage a statement made by Giustiniano that he never wishes Belisario to set eyes on him again, has had the hero’s eyes put out. Irene appears. Aware of this terrible news, she has come to act as Belisario’s companion and guide in his exile. Alamiro solemnly curses Byzantium and takes his leave, clearly intending to join the hostile barbarian tribes of the Alani and the Bulgars who are threatening to descend upon the city. The gates of the prison open, and Eusebio, the warden, delivers the maimed Belisario, his eyes bandaged, into Irene’s keeping. Belisario is at first unaware of the identity of his guide, and asks her to go to his home and bring his daughter to him that he may take a last farewell of her. At this Irene is unable to maintain her silence any longer, and confesses that she is that very daughter. After a joyful though tearful reunion, they set out together, escorted by guards as far as the city limits. SCENE I A desert landscape, with the high mountain chain of the Emo in the background. Irene and Belisario appear, both exhausted from their endless walking, but Belisario at least with his eye sockets no longer bandaged. As they take a short rest, a distant calling of trumpets is heard, and Irene, climbing a rock, perceives that a column of armed men is advancing upon them. She persuades Belisario to take shelter in a shallow cave. The army of the Alani and the Bulgars enters, under the command of Alamiro, Ottario and others. They expect imminently to join battle with the Greeks, and Alamiro encourages them by declaring that, as soon as they raise the cry of ‘Belisario’, all the latter’s veterans will desert to their side. At this Belisario steps forward, ordering them to halt. He rebukes Alamiro, declaring that he belies his claim to be a Greek. Alamiro’s response is not merely to repeat his story of being abandoned on the seashore as a child and of being brought up by the barbarian sailor who came across him, but, further, to produce a cross and a dagger which were found with him. From inscriptions engraved on these objects it becomes evident that Alamiro is, in fact, Alessi. A joyful reunion takes place between him and his father and sister. A momentary obstacle arises when the barbarians demand that he continue to act as their commander – he had sworn to lead them until Byzantium should be razed to the ground – but Ottario releases him from his oath and all depart, the barbarian army by one path, and Belisario, Alessi and Irene by another. To Ottario’s final remark that they will conquer Greece even without Belisario, Belisario replies that every Greek, fighting for his homeland, will become a Belisario. SCENE II The tent of Giustiniano. The Emperor, just arrived in the field, declares his intention of joining battle the following morning. His preparations are, however, interrupted by the arrival of Antonina, distraught, dishevilled and conscience-stricken, unable to conceal any longer that she and Eutropio had had Belisario’s letters altered with forged additions and had so secured his condemnation. All she wishes now is to die, but not before she has sought out Belisario and pleaded for his forgiveness. Distant voices are heard, proclaiming victory, and Irene brings news both of the rediscovery of Alessi in Alamiro and of an all-but-miraculous putting to flight of the barbarian army, routed by none other than Belisario himself. All feelings of joy are rapidly dispelled, however, for the shouts of victory are followed by a doleful sound of trumpets and the announcement, by a centurion, that Belisario has been fatally wounded by a dart released by the fleeing barbarians. He is carried in dying, and entrusts his children to the care of Giustiniano. Antonina then approaches to ask his pardon, but before he can either grant her wish or deny her he falls back lifeless. In her despair, she imagines that he has continued to curse her even in this moment of death and now flies to accuse her before the throne of God. Beside herself, she tries to flee, but, finding herself before the corpse, she utters a cry and collapses to the ground. 1. Szene Ein großer Hof im Königspalast in Byzantium, an einer Seite ein Thron. Eine Kolonnade im Hintergrund der Bühne gibt den Blick auf die Stadt frei. Viele Menschen, darunter auch Senatoren, versammeln sich, um den Triumph des Generals Belisario zu feiern, der erfolgreich von seinem Feldzug auf der italienischen Halbinsel heimkehrt. Seine Tochter Irene eilt herbei, um sich der wachsenden Schar anzuschließen, die sich zu seiner Begrüßung einfindet. Ihre Mutter Antonina jedoch legt erkennbar große Zurückhaltung an den Tag. Sie tritt zusammen mit Eutropio auf, dem Anführer der kaiserlichen Leibgarde, der sich Hoffnungen macht, ihr Geliebter zu werden, und berichtet von ihrer Überzeugung, dass Belisario vor vielen Jahren für den Tod ihres gemeinsamen kleinen Sohnes Alessi verantwortlich sei. Während Belisarios Abwesenheit hatte einer seiner Sklaven, Proclo, auf dem Totenbett gestanden, sein Herr habe ihn damals beauftragt, Alessi zu ermorden. Er, Proclo, habe mit dem Kleinen gehorsam die Stadt verlassen, es dann aber nicht übers Herz gebracht, ihn zu töten, sondern habe ihn am Meeresufer ausgesetzt und seinem Schicksal überlassen. In der Überzeugung, dass Alessi schon lange tot ist, und angesichts des schweren Vorwurfs, den sie damit gegen Belisario erheben kann, hat Antonina zusammen mit Eutropio einen Plan geschmiedet mit dem Ziel, ihren Gemahl zu vernichten, und Dokumente gefälscht, die ihn des Verrats gegen Kaiser Giustiniano bezichtigen. Eutropio beschwört Antonina, den Schein zunächst noch zu wahren, und so schließt auch sie sich der jubelnden Menge an. In Begleitung seiner kaiserlichen Leibgarde tritt Kaiser Giustiniano ein und besteigt den Thron. Dann erscheint in Triumph Belisario, mit Lorbeeren gekrönt, einen purpurroten Umhang über der goldenen Rüstung. Er steigt von seinem Streitwagen herab und überreicht Giustiniano seine Trophäen, bittet aber um das Leben seiner Gefangenen. Diese Bitte gewährt Giustiniano und legt deren Schicksal in Belisarios Hände. Als sich die Menge zerstreut, setzt Belisario die Gegangenen frei. Einer jedoch weigert sich zu gehen: Der junge Krieger Alamiro beteuert, von Belisario getrennt, sei das Leben für ihn ohne Sinn. Die beiden Männer fühlen eine starke Verbindung zueinander, und nachdem Alamiro von seiner byzantinischen Herkunft berichtet hat, bittet Belisario ihn, Mitglied seines Haushalts zu werden und die Stelle seines vor langer Zeit verlorenen Sohnes einzunehmen. Irene und Antonina treten hinzu, doch ihr Wiedersehen mit Belisario wird bald von Eutropio gestört, der hereinkommt und im Namen des Kaisers die Herausgabe von Belisarios Schwert verlangt. Allgemein herrscht große Bestürzung, aber Belisario gehorcht, überreicht sein Schwert jedoch nicht Eutropio, sondern einem Mann, den er nach seinen eigenen Worten als Krieger achten kann: Alamiro. Entwaffnet wird er abgeführt. 2. Szene Der Senatssaal. Die Senatoren treten ein, verwundert, weshalb sie in aller Eile einberufen wurden. Giustiniano teilt ihnen mit, dass Belisario ein schreckliches Verbrechen zur Last gelegt wird. Dann erklärt Eutropio, der General habe einen Plan geschmiedet, nach dem sich an eben diesem Abend die siegreichen Truppen erheben, Giustiniano ermorden und Belisario zum Kaiser ausrufen sollen. Belisario streitet jedes solche Ansinnen vehement ab, sieht sich jedoch in Erklärungsnot, als Eutropio Briefe vorlegt, die der General seiner Gemahlin vom Feldzug schrieb, jetzt allerdings ergänzt um Sätze, in denen er von einem geplanten Hochverrat spricht; sie sind in einer gekonnten Fälschung seiner Handschrift geschrieben. Antonina setzt sich mitnichten für ihren Gemahl ein, sondern erklärt vielmehr, diese Briefe seien eben diejenigen, die sie erhalten habe. Als Belisario ihr vorwirft, alle natürlichen Pflichten und Gefühle einer Ehefrau zu vergessen, spielt sie ihren Trumpf aus: der Vorwurf, Belisario habe den Mord Alessis veranlasst. Zu seiner Verteidigung kann Belisario lediglich anführen, dass er einen entsetzlichen Traum gehabt habe, in dem Alessi, wenn er lebte, eines Tages das Byzantinische Reich bis an seine Grundfeste erschüttern werde. Daher habe er sich, wider allen väterlichen Gefühlen, für den Schutz seines Landes entschieden. Diese Erklärung verliert angesichts von Antoninas Heftigkeit aber jedes Gewicht, und so wird Belisario, verflucht von allen außer Irene und Alamiro, in den Kerker abgeführt. 1. Szene Ein abgelegener Teil Byzantiums am Eingang zu den Kerkern. Alamiro hat erfahren, dass das Todesurteil gegen Belisario in lebenslange Verbannung verwandelt wurde, doch wie die bekümmerten Veteranen ihn rasch aufklären, hat Eutropio die Äußerung Giustinianos, Belisarios Augen mögen ihn nie mehr streifen, in seinem perfiden Sinne ausgelegt und den Helden blenden lassen. Irene tritt hinzu. Sie hat die schreckliche Nachricht bereits erfahren und ist gekommen, um Belisario ins Exil zu begleiten und ihm als Führerin zu dienen. Alamiro verflucht Byzantium und verlässt die Stadt; er hat unverkennbar im Sinn, sich den feindlichen Barbarenstämmen der Alanen und Bulgaren anzuschließen, die in die Stadt einzufallen drohen. Die Kerkertore öffnen sich und Eusebio, der Wärter, übergibt den verstümmelten Belisario, dessen Augen verbunden sind, der Obhut Irenes. Belisario ist sich zunächst der Identität seiner Führerin nicht bewusst und bittet sie, zu seinem Haus zu gehen und seine Tochter zu ihm zu bringen, damit er sich ein letztes Mal von ihr verabschieden könne. Als Irene diesen Wunsch hört, kann sie nicht länger schweigen und gesteht, dass sie seine Tochter ist. Nach einer freudigen, wenn auch von Trauer begleiteten Begrüßung brechen Vater und Tochter gemeinsam auf, Wachposten begleiten sie bis an die Stadtgrenze. 1. Szene Eine Wüstenlandschaft, im Hintergrund eine hohe Gebirgskette. Irene und Belisario erscheinen, beide erschöpft von der ständigen Wanderschaft, doch zumindest sind Belisarios Augenhöhlen nicht mehr verbunden. Während einer kurzen Rast hören sie aus der Ferne Trompetenrufe, Irene steigt auf einen Felsen und sieht, dass eine Kolonne Bewaffneter näher kommt. Sie überzeugt Belisario davon, die Sicherheit einer kleinen Höhle aufzusuchen. Das Heer der Alanen und Bulgaren unter dem Oberbefehl Alamiros, Ottarios und anderer erscheint. Sie rechnen damit, jederzeit die Schlacht gegen die Byzantiner aufzunehmen, und Alamiro spricht ihnen Mut zu und versichert, sobald sie den Schlachtruf „Belisario“ erheben, würden all dessen Veteranen zu ihnen überlaufen. Als Belisario dies hört, tritt er vor, befiehlt ihnen stehen zu bleiben und beschuldigt Alamiro, seine byzantinische Herkunft zu verraten. Daraufhin schildert dieser nicht nur seine Geschichte, dass er als Kind am Meeresufer ausgesetzt und von einem Barbaren-Seemann gefunden und groß gezogen wurde, sondern holt auch ein Kreuz und einen Dolch hervor, die neben ihm lagen und aus deren Inschriften hervorgeht, dass es sich bei Alamiro in Wirklichkeit um Alessi handelt. Glücklich feiern Sohn, Vater und Schwester das Wiedersehen, nur ein Hindernis stellt sich ihnen noch in den Weg, denn die Barbaren verlangen, dass Alessi weiterhin als ihr Befehlshaber dient – er hatte geschworen, sie gegen Byzantium zu führen, bis die Stadt in Schutt und Asche liegt -, doch Ottario entbindet ihn von seinem Eid. Alle gehen ihrer Wege, das Barbarenheer schlägt eine Richtung ein, Belisario, Alessi und Irene eine andere. Auf Ottarios abschließende Bemerkung hin, dass sie Byzantium auch ohne Belisario erobern werden, erwidert Belisario, dass jeder Byzantiner, der für seine Heimat kämpft, zu einem Belisario werde. 2. Szene Das Zelt Giustinianos. Der Kaiser ist gerade im Lager eingetroffen und erklärt seine Absicht, am folgenden Morgen in die Schlacht zu ziehen. Allerdings wird er bei seinen Vorbereitungen unterbrochen durch die Ankunft einer verzweifelten Antonina, die von Gewissensbissen gequält wird und nicht mehr mit der Schuld leben will, zusammen mit Eutropio Belisarios Briefe gefälscht zu haben, damit er in die Verbannung geschickt würde. Nun möchte sie sterben, doch erst, nachdem sie Belisario wieder gesehen und ihn um Vergebung angefleht hat. Aus der Ferne sind Stimmen zu hören, die den Sieg verkünden, und Irene überbringt die Nachricht, dass Alessi in der Gestalt Alamiros zurück gekehrt ist, erklärt aber auch, dass das Barbarenheer fast wie durch eine Wunder in die Flucht geschlagen wurde, und zwar von keinem anderen als Belisario. Die Freude versiegt jedoch sofort, denn auf die Siegesrufe folgt eine klagende Trompetenfanfare, dann überbringt ein Zenturio die Nachricht, dass Belisario von einem Pfeil der fliehenden Barbaren tödlich verwundet wurde. Sterbend wird er herein getragen und überantwortet seine Kinder der Fürsorge Giustinianos. Antonina tritt zu ihm, um ihn um Vergebung zu bitten, doch ehe er sie ihr gewähren oder abschlagen kann, fällt er leblos zurück. In ihrer Verzweiflung glaubt Antonina, er habe sie selbst im Moment des Todes noch verflucht und eile nun, um sie vor dem Thron Gottes anzuklagen. Außer sich, will sie die Flucht ergreifen, sinkt angesichts des Leichnams vor sich jedoch, einen Schrei ausstoßend, zu Boden. SCENA I Un grande cortile nel palazzo reale di Bisanzio: da una parte è sistemato un trono. In fondo alla scena, dietro una colonnata, si può vedere la città. I senatori e il popolo si riuniscono per festeggiare il trionfo del generale Belisario, che torna vittorioso dalla penisola italiana, dove ha combattuto contro i Goti. Sua figlia Irene è una delle prime ad accorrere per accoglierlo e si affretta a raggiungere la folla sempre più fitta, all’esterno. Sua madre Antonina, invece, non manifesta la stessa impazienza. Entrando con Eutropio, capo delle guardie imperiali, che spera di diventare suo amante, la donna rivela che Belisario si è reso responsabile della morte del figlioletto Alessi, molti anni prima. Durante l’ultima assenza di Belisario, uno dei suoi schiavi, Proclo, ha confessato in punto di morte che il padrone aveva ordinato di uccidere il piccolo Alessi. Lo schiavo aveva poi portato fuori città il bambino ma, incapace di commettere il delitto, l’aveva abbandonato sulla spiaggia al volere del fato. Convinta che Alessi sia morto e armata di questa prova schiacciante contro Belisario, Antonina ha complottato con Eutropio contro il marito. I due hanno falsificato alcuni documenti per incriminarlo e dichiararlo traditore dell’imperatore Giustiniano. Quando Eutropio la sollecita a mantenere le apparenze, anche Antonina esce per unirsi alla folla. Entra l’imperatore Giustiniano, accompagnato dalle guardie imperiali, e sale sul trono per assistere al Trionfo di Belisario. Il generale entra, vestito di un’armatura d’oro, ammantato di porpora e incoronato d’alloro. Scende dal carro e offre i suoi trofei a Giustiniano, ma chiede di risparmiare la vita dei prigionieri. Giustiniano accetta, e affida a lui il loro destino. Tutti si allontanano e Belisario libera i prigionieri. Uno di loro, però, rifiuta di andarsene. Alamiro, un giovane guerriero, dichiara che la vita per lui non avrebbe significato se dovesse separarsi da Belisario, a cui è molto legato. Poiché Alamiro dichiara di essere di origine greca, Belisario lo invita a entrare in casa sua e a prendere il posto del figlio da tempo perduto. Adesso Irene e Antonina raggiungono Belisario, ma la loro riunione viene ben presto interrotta da Eutropio che entra e, a nome dell’imperatore, esige che Belisario consegni la spada. Tra la costernazione generale, Belisario obbedisce e consegna l’arma non a Eutropio, ma a un guerriero degno del suo rispetto: Alamiro. Quindi viene disarmato e condotto fuori da Eutropio e dalle guardie. SCENA II. La Sala del Senato. I senatori, riuniti, si chiedono il perché dell’affrettata convocazione. Giustiniano comunica che Belisario è stato accusato di un orrendo delitto. Eutropio inizia a narrare che, proprio per quella sera, è stata organizzata una rivolta delle truppe vittoriose per assassinare Giustiniano e proclamare Belisario imperatore al suo posto. Belisario nega risolutamente l’esistenza di un complotto, ma non riesce a trovare spiegazioni quando Eutropio esibisce le lettere inviate dal generale ad Antonina, in cui sono contenute alcune frasi che rivelano il tradimento. Si tratta di aggiunte con grafia falsa, ma identica a quella di Belisario. Anziché difendere il marito, Antonina conferma che le lettere sono autentiche. Quando Belisario l’accusa di tradire i sentimenti naturali e i doveri di una moglie, la donna gioca la propria carta segreta: Belisario ha organizzato l’assassinio di Alessi. A propria difesa, Belisario può solo raccontare la propria versione dei fatti. Un sogno orribile gli aveva rivelato che, se fosse vissuto, Alessi avrebbe indebolito l’impero greco fino alle radici. Per questo, a dispetto di ogni impulso paterno, aveva preso la tragica decisione per proteggere il proprio paese. Ma la spiegazione è inutile di fronte alla veemenza di Antonina. Belisario, condannato da tutti tranne Irene e Alamiro, viene condotto in prigione. SCENA I Una parte remota di Bisanzio, all’ingresso delle prigioni. Alamiro ha saputo che la pena di morte per Belisario è stata commutata in esilio perpetuo. Purtroppo, i veterani dell’esercito gli rivelano anche che Eutropio l’ha fatto accecare, travisando volutamente una frase di Giustiniano. Entra Irene che, informata della terribile notizia, è venuta per essere compagna d’esilio e guida di Belisario. Alamiro maledice solennemente Bisanzio e si accomiata: è chiaro che vuole unirsi alle tribù barbare ostili degli Alani e dei Bulgari che minacciano di attaccare la città. Si aprono le porte della prigione e il guardiano, Eusebio, consegna a Irene l’infermo Belisario, con gli occhi bendati. Inizialmente Belisario non riconosce la propria guida e le chiede di andare a casa sua e condurre fino a lui la figlia per un ultimo addio. Irene non riesce più a trattenersi e confessa la sua vera identità. Padre e figlia si ritrovano con gioia e commozione, poi si incamminano insieme, scortati dalle guardie fino ai confini della città. SCENA I Un paesaggio deserto, con l’alta catena montuosa dell’Emo sullo sfondo. Entrano Irene e Belisario, entrambi sfiniti dal lunghissimo vagare. Belisario non ha più gli occhi bendati. Mentre fanno un breve riposo, si sente in lontananza un richiamo di trombe. Dopo essersi arrampicata su una roccia, Irene vede una colonna di uomini armati avvicinarsi e convince Belisario a ripararsi in una grotta. Entra un’orda di Alani e Bulgari, comandati da Alamiro, Ottario e altri. Si prevede una battaglia imminente contro i Greci e Alamiro li incoraggia dichiarando che basterà pronunciare la parola “Belisario” ai suoi veterani per provocarne l’immediata diserzione. A questo punto Belisario si fa avanti e ordina a tutti di fermarsi. Rimprovera Alamiro e lo accusa di non essere greco. Alamiro risponde narrando la storia del suo abbandono sulla spiaggia da bambino e dice di essere stato trovato e allevato da un marinaio barbaro. Poi esibisce una croce e un pugnale che erano stati trovati con lui. Dalle iscrizioni incise su due oggetti è ormai evidente che Alamiro e Alessi sono la stessa persona. Segue una gioiosa riunione tra il guerriero, il padre e la sorella. Ma c’è un problema: i barbari esigono che il giovane continui a essere il loro comandante e gli ricordano che aveva giurato di guidarli finché Bisanzio non fosse stata rasa al suolo. Ottario però lo solleva dal suo giuramento e tutti si allontanano, l’esercito dei barbari da una parte e Belisario, Alessi e Irene dall’altra. Prima di dividersi, però, Ottario dichiara che comunque la sorte della Grecia è segnata, senza Belisario. Il generale replica che ogni Greco che combatte per la patria diventa Belisario. SCENA II La tenda di Giustiniano. L’imperatore, appena arrivato sul campo, dichiara che intende avviare la battaglia la mattina dopo. I preparativi sono però interrotti dall’arrivo di Antonina, sconvolta, scarmigliata, in preda al rimorso e ormai incapace di tacere: è stata lei d’intesa con Eutropio a modificare con aggiunte false le missive di Belisario ed è lei responsabile della sua condanna. Ora desidera solo morire, ma prima vuole trovare Belisario e chiedergli perdono. Alcune voci in lontananza proclamano la vittoria. Entra Irene con la notizia del ritrovamento di Alessi sotto le spoglie di Alamiro e della miracolosa fuga dell’esercito barbaro, allontanato da Belisario in persona. Ogni sentimento di gioia però si dilegua: le grida di vittoria sono seguite da un doloroso squillo di trombe. Un centurione annuncia che Belisario è stato mortalmente ferito da una freccia scoccata dai barbari in fuga. Il generale, morente, viene trasportato sulla scena e affida i figli alle cure di Giustiniano. Antonina si avvicina per chiedergli perdono ma Belisario non può o non riesce a rispondere e ricade, privo di vita. Travolta dalla disperazione, la donna pensa di essere stata maledetta dal marito morente che adesso sta per accusarla davanti al trono di Dio. Fuori di sé, cerca di fuggire ma, vedendosi davanti il cadavere, con un urlo si accascia a terra. SCÈNE 1 Le palais royal de Byzance. Au premier plan, la cour d’honneur où un trône est installé sur le côté ; à l’arrière-plan, une colonnade qui domine le panorama de la ville. Les sénateurs et la population sont venus assister au triomphe du général Belisario revenu victorieux de la péninsule italienne. Impatiente de le saluer comme beaucoup, sa fille Irene rejoint en hâte la foule grandissante. Antonina, son épouse, ne manifeste pas le même enthousiasme. Entre Eutropio, capitaine de la garde impériale qui rêve de s’attacher les faveurs d’Antonina. Celle-ci lui révèle qu’elle croit Belisario responsable jadis de la mort de leur jeune fils Alessi. Pendant que Belisario était en campagne, l’un de ses esclaves, Proclo, a avoué sur son lit de mort que son maître lui avait ordonné d’assassiner l’enfant. Après avoir a emmené le petit Alessi loin de la ville, il n’avait pu toutefois lui porter le coup fatal et l’avait abandonné sur le rivage laissant ainsi le destin décider de sa vie ou de sa mort. Convaincue qu’Alessi n’a pas survécu, Antonina dispose de preuves accablantes contre Belisario et entend précipiter sa chute avec la complicité d’Eutropio. Ensemble ils ont falsifié des documents de manière à le faire accuser de haute trahison contre l’empereur Giustiniano. Eutropio presse Antonina de se joindre à la foule en liesse pour ne pas éveiller les soupçons. Accompagné de la garde impériale, l’empereur Giustiniano arrive et monte sur le trône. Pour la cérémonie du triomphe, Belisario apparaît couronné de lauriers et arborant un manteau pourpre sur son armure dorée. Il descend de son chariot, présente ses trophées à Giustiniano et lui demande d’accorder la vie sauve à ses prisonniers. L’empereur y consent et le laisse disposer d’eux. Tandis que la foule se disperse, Belisario libère ses prisonniers. Un jeune guerrier nommé Alamiro, qui se trouvait parmi eux, refuse de partir en déclarant que sa vie perdrait son sens s’il était obligé de quitter Belisario. L’attachement est, en fait, réciproque. Comme Alamiro se dit d’origine grecque, Belisario l’invite à venir vivre auprès de lui et à occuper la place de son fils disparu. Irene et Antonina rejoignent Belisario, mais leurs retrouvailles sont bientôt interrompues par l’arrivée d’Eutropio venu désarmer Belisario au nom de l’empereur. La consternation est générale. Belisario obéit mais insiste pour remettre son épée, non pas à Eutropio, mais à un guerrier qu’il respecte : Alamiro. Une fois désarmé, le général est emmené par Eutropio et ses gardes. SCÈNE 2 Le Sénat où les sénateurs se demandent pourquoi ils ont été convoqués dans la plus grande précipitation. Giustiniano leur apprend que Belisario est accusé d’un crime odieux. Eutropio leur explique que le soir même les troupes victorieuses étaient censées se soulever contre Giustiniano et l’assassiner afin de proclamer Belisario empereur à sa place. Belisario nie énergiquement l’existence d’un tel complot mais, lorsque Eutropio produit des lettres écrites à Antonina pendant la campagne, le général ne parvient pas à expliquer pourquoi elles contiennent des propos accablants qui y ont été ajoutés dans une écriture qui ressemble – à s’y méprendre – à la sienne. Loin de se porter au secours de son mari, Antonina confirme que ces lettres sont bien celles qu’elle a reçues et, au moment où Belisario l’accuse de trahir son affection ainsi que ses devoirs naturels d’épouse, elle produit sa carte maîtresse en l’accusant d’avoir fait assassiner Alessi. Pour sa défense, Belisario explique qu’il a vu en rêve l’empire grec ébranlé dans ses fondations même par un Alessi parvenu à l’âge adulte. S’il a agi, c’est à contrecœur et pour protéger sa patrie. Ses explications sont vaines face à la véhémence d’Antonina ; abandonné de tous, sauf d’Irene et Alamiro, Belisario est conduit en prison. SCÈNE 1 L’entrée de la prison dans un quartier reculé de Byzance. Alamiro a appris que la condamnation à mort de Belisario a été commuée en exil à perpétuité mais, comme s’empressent de le lui annoncer des vétérans attristés, Eutropio lui a fait crever les yeux en prétextant que l’empereur avait déclaré qu’il espérait que le prisonnier ne poserait plus jamais le regard sur lui. Irene apparaît. En apprenant la terrible nouvelle, elle a décidé d’accompagner son père en exil et de lui servir de guide. Alamiro maudit solennellement Byzance et part rejoindre les Alains et les Bulgares qui menacent d’attaquer la ville. Les portes de la prison s’ouvrent et le gardien Eusebio confie Belisario, un bandage sur les yeux, aux bons soins d’Irene. Belisario, qui ignore tout de l’identité de son guide, lui demande d’aller chercher sa fille pour qu’il puisse lui dire un dernier adieu. Incapable de garder le silence plus longtemps, Irene lui révèle son identité. Ils s’embrassent dans la joie et la douleur avant de se mettre en route, escortés par des soldats jusqu’aux portes de la ville. SCÈNE 1 Un paysage désertique sur fond de montagnes. Irene et Belisario entrent, manifestement épuisés par leur longue marche ; Belisario ne porte plus de bandage. Tandis qu’ils s’accordent un bref moment de repos, un bruit de fanfare se fait entendre au loin ; Irene gravit un rocher et aperçoit une colonne d’hommes armés se dirigeant vers eux. Elle persuade Belisario de se réfugier dans une petite grotte. Les soldats alains et bulgares apparaissent avec Alamiro, Ottario et quelques autres à leur tête. Ils se préparent à livrer bataille aux Grecs. Alamiro les encourage en leur disant qu’aux cris de « Belisario », les vétérans grecs déserteront et viendront combattre à leurs côtés. À ces paroles, Belisario se manifeste et leur ordonne de renoncer, en reprochant à Alamiro son attitude indigne d’un Grec. Pour toute réponse, Alamiro raconte qu’enfant il a été abandonné sur une plage et recueilli par un marin barbare qui l’a élevé comme son fils ; il montre alors la croix et le poignard alors trouvés sur lui. Les objets en question portent des inscriptions qui prouvent qu’Alamiro est en fait Alessi. Les heureuses retrouvailles entre le fils, le père et la sœur ne durent guère car les Barbares exigent qu’Alamiro les conduise, comme prévu, à la bataille – il a, en effet, juré de rester à leur tête jusqu’à l’anéantissement complet de Byzance. Ottario le libère de son serment en prenant sa place et en déclarant que la Grèce sera conquise même sans Belisario ; ce à quoi celui-ci répond que tous les Grecs combattant pour leur patrie deviendront des Belisario. Les Barbares partent d’un côté, Belisario, Alessi et Irene de l’autre. SCÈNE 2 La tente de Giustiniano. L’empereur, arrivé de fraîche date, déclare son intention de prendre part à la bataille du lendemain matin. Ses préparatifs sont interrompus par l’arrivée d’une Antonina échevelée, désemparée et rongée par le remords, incapable de dissimuler plus longtemps qu’elle a falsifié les lettres de Belisario avec la complicité d’Eutropio afin de faire condamner son époux. Elle ne souhaite plus que mourir, mais pas avant de l’avoir retrouvé pour lui demander pardon. On entend au loin des cris de victoire et Irene vient annoncer qu’Alamiro est nul autre qu’Alessi et que les Barbares ont été miraculeusement battus en brèche par Belisario lui-même. La joie est toutefois de courte durée car les cris de victoire sont rapidement suivis par des coups de trompettes qui retentissent tristement alors qu’un centurion vient annoncer que Belisario a été mortellement blessé par la flèche d’un Barbare en fuite. On l’amène agonisant sur une litière et il confie ses enfants aux bons soins de Giustiniano. Antonina s’approche de lui, mais il retombe sans vie avant d’avoir pu lui accorder ou lui refuser son pardon. Dans son désespoir, elle imagine qu’il l’a maudite jusque dans la mort et que son âme s’élève vers le Ciel en l’accusant. Hors d’elle-même, elle cherche à fuir, mais à la vue du cadavre pousse un cri et s’effondre.